Maldives Residences, yet another upcoming serviced residence development by Ideal Property Group at Bayan Lepas. Strategically located along Jalan Sungai Tiram 1, easily accessible via Jalan Tun Dr Awang. 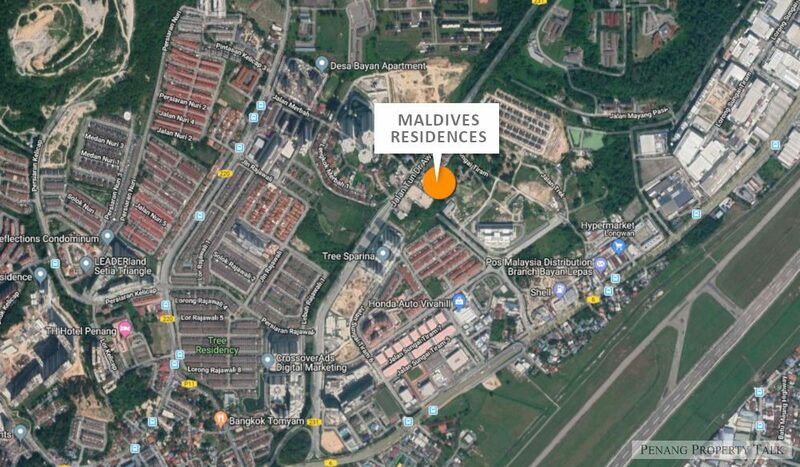 It is less than 2km away from Penang International Airport just a stone’s throw away from Sunsuri Residences development. Other neighboring housing schemes include Tree Sparina, The Amarene, Summerskye Residences, Mori Condominium, The Clovers, and a few others. The new SMJK Heng Ee Secondary School (Bayan Baru branch) is within walking distance. This development comprises a few 21-storey buildings, offering a total of 1,665 residential units with indicative price from RM500,000 onwards. Got so high demands? How many up coming projects? what a good name, Maldives Residence. Targeted for resident from South Asia? Wah, so many high rise from Ideal. It is serviced apartment. Don’t buy if you don’t want homestay. Homestay should be barred from using apartments, sure to turn into a mess very soon. Experience talk. This project same as published @ Ideal webisite? Ideal Vision City.